Well, I am in the almost done with my finals by the end of this week and just drop by to say hello to everyone and for those who are still struggling with gift ideas - this post is just for you! 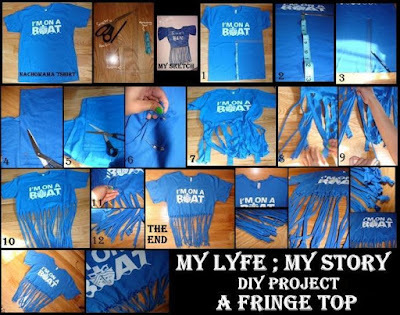 This tutorial is going to help you recycle you old t-shirt into something trendy and new. Or, this could just be an addition thing to your favourite t-shirt. Well, one way or another was one of the trends I wasn’t sure whether I could pull it off or not. However, thankfully I got the guts to make one and try it out. (To my surprise it worked out well, better than I planned). So, as usually I made a collage with all the photos. For this tutorial all you need is a T-Shirt, a pair of scissor, a long ruler, a measuring tape (optional) and a pencil. Step 1:Use the measuring tape to measure the length on how cropped you what your t-shirt to be. Step 2: Make small markings on the t-shirt. Step 3: Now, use the ruler to draw perfect lines (perfect a possible) from the marking to the end of the t-shirt. Step 4 & 5: After drawing all the lines start cutting the lines straight. Start from the bottom to the top where the marking is places. Step 6 & 7: After cutting all the strands make sure to untangle them all. Step 8 & 9: Now, stretch all the strands one bu one. Step 10: Once again after stretching them all, untangle them again. Step 11: This is optional: Make a knot on the top where the strand begins. Step 12: This is also optional: Make a knot on the bottom where the strand ends. And this will be my very last DIY & ReVamp post for 2011 and I hope everyone like it!